Written in concise and clear language, this book offers an historical overview of literary criticism and theory throughout the twentieth century along with a close analysis of some of the most important and commonly taught texts from the period. M.A.R. Habib is Associate Professor of English at Rutgers University. He received his D.Phil. in English from Oxford University, and is the author of five books, including A History of Literary Criticism and Theory: From Plato to the Present (Blackwell, 2005). Formative Moments in the History of Literary Criticism. 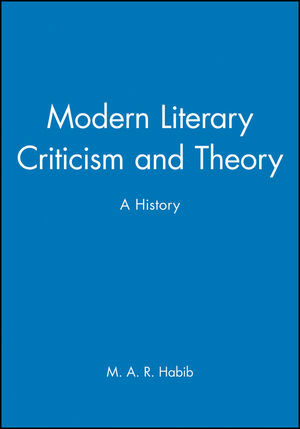 Historical Backgrounds of Modern Criticism and Theory. The Scope of Modern Literary and Cultural Criticism. 1. The First Decades: From Liberal Humanism to Formalism. The New Humanists, Neo-Romantics, and Precursors of Formalism. The Poetics of Modernism: W.B. Yeats, Ezra Pound, T. S. Eliot. William K. Wimsatt, Jr. (1907–1975) and Monroe C. Beardsley (1915–1985). 2. Socially Conscious Criticism of the Earlier Twentieth Century. F. R. Leavis (1895–1978) and Scrutiny. The Fundamental Principles of Marxism. Marxist Literary Criticism: A Historical Overview. Early Feminist Criticism: Virginia Woolf and Simone de Beauvoir:. 3. Criticism and Theory After the Second World War. Edmund Husserl (1859–1938) and Phenomenology. Martin Heidegger (1889–1976) and Existentialism. Georges Bataille (1897–1962) and Heterology. 4. The Era of Poststructuralism (I): Later Marxism, Psychoanalysis, Deconstruction. Jacques Derrida (1930–2004) and Deconstruction. 5. The Era of Poststructuralism (II): Postmodernism, Modern Feminism, Gender Studies. bell hooks (Gloria Jean Watkins; b. 1952). Eve Kosofsky Sedgwick (b. 1950). 6. The Later Twentieth Century: New Historicism, Reader-Response Theory, and Postcolonial Criticism. Gayatri Chakravorty Spivak (b. 1942). Homi K. Bhabha (b. 1949). Henry Louis Gates, Jr. (b. 1950). 7. Cultural Studies and Film Theory. Andrew Sarris (b. 1928) and Auteur Theory. Jim Kitses: The Study of Genre. Christian Metz (1931–1993): A Psychoanalytic Perspective. Laura Mulvey (b. 1941): Feminist Film Theory. 8. Contemporary Directions: The Return of the Public Intellectual. The New Liberalism: Martha Nussbaum, Elaine Scarry, John Carey:. The New Theorists of Revolution: Žižek, Hardt, Negri. Michael Hardt and Antonio Negri: The Concept of Empire. Epilogue: The Myth of Liberal Humanism.